“Lee Daniels’ The Butler” was #1 for the third time once all of the receipts were counted across the four-day weekend. “This Is Us” opened on Thursday night and collected an estimated $18 million through Labor Day, while “The Butler” grabbed another $20 million for a $79.3 million total. “Getaway” and “Closed Circuit” both flopped while the Spanish-language “Instructions Not Included” did better than expected. The box-office haul of “This Is Us” was certainly still a victory for Niall, Zayn, Liam, Louis and Harry. While the Directioners who flocked to see the 3-D documentary (65 percent of whom were under 17 and 85 percent of whom were female) didn’t outnumber the Beliebers who gave “Never Say Never” a nearly $30 million debut, “This Is Us” managed to beat the recent documentaries from Katy Perry and the Jonas Brothers. Considering the fact that audiences who saw “This Is Us” gave it a CinemaScore of “A” and that it contributed to the biggest overall Labor Day weekend gross in history, it’s safe to say Sony Pictures’ TriStar brand was happy with the fruits of “Super Size Me” director Morgan Spurlock’s labor especially given that $10 million budget. “We’re the Millers” came in third with $14.9 million across the four-day weekend, putting the new comedy from “Horrible Bosses” co-stars Jason Sudeikis and Jennifer Aniston at $112.9 million. Disney’s “Cars” spinoff “Planes” was #4 with $10.6 million in its fourth week for a domestic total of $73.6 million. “Instructions Not Included” managed to crack the top five with a $10 million debut despite playing at less than 350 locations; by comparison, “The Butler” was in 3330. The Los Angeles Times called it a “sweet, funny and poignant comedy.” One of the worst-reviewed films of the year, “Getaway,” was in over 2100 theaters and made a lousy $5.5 million. “Closed Circuit” has made $3 million since opening on Wednesday in 870 theaters. Unlike last summer, which yielded both The Dark Knight Rises (56.3m) and Avengers Assemble (51.6m), no film this year has cracked 50m. Top picture is Despicable Me 2, currently at 44.8m. To identify which films have over- and underperformed, it’s helpful to compare UK results with the US and by rule of thumb you might expect the UK gross, in pounds, to be one-tenth of the US dollar amount. 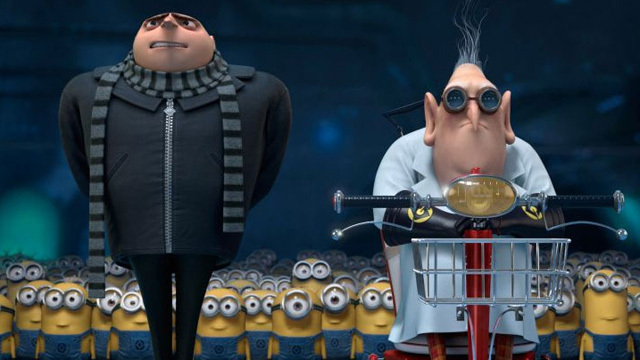 By that logic, Despicable Me 2 has done even better in the UK than it did in the US, where its gross has reached $351m. Over there, top film is Iron Man 3, with $409m, meaning that the UK result of 37m is slightly behind the pace but of course differences in audience taste in the two key English-speaking markets can account for these variations. The biggest overperformer in the UK is perhaps surprisingly The Hangover Part III, with 19.3m, as against $112m in the US. Overall, sequels and films based on existing characters (such as Man of Steel ) or established material ( The Great Gatsby , World War Z ) overwhelmingly dominate this summer’s box-office see the chart below. Top film not based on familiar elements is Now You See Me , with 11.0m, although you could argue that the animation Epic (13.6m) didn’t rely for its audience on familiarity with the William Johnson source material, The Leaf Men and the Brave Good Bugs. Animation is a field where new stories have been shown to flourish, supported by the marketability of powerful brands such as Disney, Pixar, DreamWorks and Fox’s Blue Sky Studios. The Conjuring is another non-sequel winner, with 9.9m to date. Notable disappointments include Disney’s famously expensive The Lone Ranger (4.4m), Sony’s Will Smith/Jaden Smith team-up After Earth (6.3m) and Warners’ Guillermo Del Toro genre-melder Pacific Rim (8.4m, although Asian success has boosted the worldwide cume to a healthy $404m). Fox may be disappointed with The Wolverine ‘s 13.6m tally, behind the total of the fan-underwhelming X-Men Origins: Wolverine (16.4m) as well as the lowest-grossing X-Men film so far in the UK. The film follows the lives of Niall Horan, Louis Tomlinson, Harry Styles, Liam Payne and Zayn Malik during their world tour. It also dives into the boys rise to global fame from their humble, working-class background to their time on UKs The X Factor through their redemption and success spurred on by their fans as well as uncertainty with how long this phenomena will last and where their collaboration will end. Humorous, quick British quips and scenes of countless screaming girl fans is very much a nod to the Beatles in A Hard Days Night, but that is where the similarities end as this is a documentary that carries more of an adult element. The themes of struggle, success, isolation, exhaustion and uncertainty creep through the movie, educating the groups teenage fans that life is not one big glamorous show. In one scene one of the parents of the boys say, I havent seen him in months. Spurlock balances the grit and unspectacular life on the road with the fun and energy when you land in the public eye. The concert footage is extremely entertaining thanks in part to the backstage antics of Harry and Nials . A number of critics have panned the film and accused director Spurlock of making a sanitary promo for the boys, because the film fails to deliver on its promise of all-access pass to the group by not showing any typical teenage bad behavior, i.e. smoking, partying or romance (I mean Harry Styles was seen drinking a beer at the VMAS and was known to be dating pop star Taylor Swift months ago). Spurlock defended his choice to not show the boys romantic lives saying they are young guys who break up and make up, and I didnt want to have a hole in my story. What the critics have forgotten is that showing the typical crazy adolescent behavior may be a bit unsavory and would likely alienate its core target audience (young girls bringing their parents). To be honest, a documentary that shows poor conduct, whether or not the boys engage in Lindsey Lohan behavior, would be for an adult audience and not suitable for the films target. What we dont want to do is edit ourselves while were shooting lets just go for it! I asked them what they personally wanted out of this film and they said that they want the fans to understand how we work and all that goes into it. We want fans to see us for who we are. You see their humble beginnings and their supportive families. How the guys compare to Justin Bieber: In the process, the five of them have become a family. They count on each other to bring one another back to earth and keep them real. I think one of the reasons these guys havent had a Bieber-episode is because they have each other. [Its not security guards] Justin has security but that doesnt stop him. Was Simon Cowell involved? Simon Cowell was very involved! He and I first talked about my vision for the film, and he added things that he thought were important. He wanted people to know that if it wasn’t for all the fans pushing for this band, nobody would know who they are. The fans really do own the success of this band. That was one of his big pushes from the start. Andy is a close friend of the singer and was last seen with pop star Liam celebrating his birthday last week. TWITTER Andy’s girlfriend Daisie Smith updated fans on his condition on Twitter – it is understood he is still recovering in hospital. Thank you so much for all of your lovely messages & prayers. On behalf of Andys family & I wed like you to know he is in a stable condition Thousands of fans were tweeting virals of Andy and Liam together, with many praising Liam for his valiant efforts. A source close to Liam said: His friend went to fill up the gas for a heating lamp, there was some sort of accident and the whole balcony went up in flames. The fire destroyed 80% of Liams balcony and it took 35 firefighters to put it out as they used breathing equipment to battle through the thick smoke. Crews said 30 people were forced to flee the building. Another man and a woman are said to have suffered superficial burns to their hands. Firefighters tweeted details of the incident as six engines from East London raced to the scene at about 9.45pm on Monday. Station Manager Laurie Kenny, who was at the scene said: Firefighters worked quickly and professionally to get the fire under control as quickly as possible. About 30 people left the building before we arrived and were not injured. Two of the occupants had superficial burns to their hands and the third had burns to his hands and face. All three have been taken to hospital. None of the other members of 1D were at the flat at the time although it is thought Liams new girlfriend Sophia Smith, 19, may have been with him. With poster-filled walls and her very own pillow, light and jersey, the little lady who sleeps in this hot-pink number obviously has One Direction dreams. Neutral love Image source: Iminlovewithliampayne via Tumblr Organized with perfectly square posters, you can hardly see any wall space in this neutral-hued One Direction room. And if the photos weren’t enough, this tween added a Polaroid comforter to cozy up to as she dreams of Liam Payne. Neon obsessed Image source: lhzlnofficial via Instagram This is perhaps the least crazy of the roundup, but it’s a One Direction-obsessed space nonetheless. 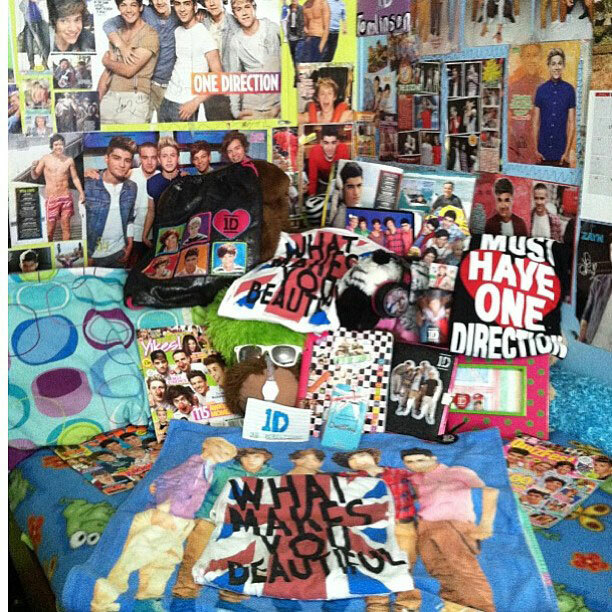 This tween can have her One Direction dreams under a neon-colored duvet that features each band member’s name. Black, white and fur all over Image source: directionerlandxoxox via Instagram For those tweens who want to be both fashionable and have a little bit of One Direction, we suggest a large black and white poster of the band’s faces. Equipped with a fur comforter and chic accessories, this fan’s room can still be stylish while she’s listening to what makes her beautiful. Pretty in One Direction pink Image source: Daffhne_1D via We heart it Keep your One Direction-loving tween’s room simple with this oversized black-and-white decal. In a room accented with light pink, black and white accessories, your One Directioner can still show her obsession in a chic style. Mellow yellow direction Image source: hisemeraldorbs via Tumblr Stay mellow and yellow with this One Direction-adoring tween’s room. With a wall featuring posters of all her favorite guys, this One Directioner keeps the decor in the rest of her space simple.